The added element of the smartphone app gives Mosaic something unique, a different experiment of sorts. Remember those books where the ending you got depended on which plot you chose? Imagine being able to do the same thing with a television show. HBO took that concept and while they didn't completely transfer it, they certainly updated it to incorporate today's technology. Imagine an app for your phone that allows you to choose different scenarios that change the ending to the story. Then imagine watching a 6 part series of a murder mystery encompassing all the characters and plots you explored on your telephone. Now you have the concept of Mosaic which aired on the premium cable network in January of 2018. Olivia Lake (Sharon Stone; Basic Instinct) is a middle-aged children's book author/illustrator who is lonely and somewhat neurotic it seems. She made enough money off of one book twenty years ago to buy a huge house and piece of land in Utah where she started a charity for children and the arts called…you guessed it, Mosaic. However, she couldn't have made that much money because now she is less than solvent and concerned about her home and land. She also takes on a young artist named Joel Hurley (Garrett Hedlund; Mudbound) to mentor him in exchange for handyman services while hoping to also seduce him. Meanwhile, Olivia meets Eric Neill (Frederick Weller; In Plain Sight) who warns her against a con artist who wants to buy her land. In reality, Neill is the con artist who woos Olivia to win her trust. Just when everything seems to be going right for Olivia, it all falls apart on New Year's Eve when she tells Joel that he needs to move out and he doesn't have enough talent to make it as an artist while she finds out that while Eric says he truly loves her he tells her the truth as to why he really met her - to con her into selling her house and land. She fights with both gentlemen and the next day she is missing and her studio is a bloody mess. The miniseries doesn't really get started until episode three when the police try to find out what happened and who is responsible. Eric is arrested but fingers are pointed at Joel as well and Eric's sister Petra, Jennifer Ferrin; The Following) starts questioning everything in an attempt to prove her brother's innocence. Of course, if you play along on the app you get different scenarios (well somewhat) as well as background on each character leaving you with a different experience than just normal television watching. Stone does what she does best playing a somewhat off-kilter yet oddly charismatic woman. Weller is at his best once Lake goes missing as he seemingly falls apart over the disappearance of the woman he loves while being accused of her murder. Hedlund is strong as the tortured artist who has a drinking problem. The rest of the supporting cast is good but the most interesting is Olivia's best friend JC played expertly by Paul Reubens (Pee Wee's Big Adventure). Before the first episode is over it is obviously clear that Mosaic is a Soderbergh (Out of Sight) production. From the grainy look to the interesting edits to the lack of establishing shots, Mosaic feels like so many of his former films. It also has a somewhat slow pace which may be one of the few drawbacks of the series. While the drama unfolds in four and a half hours it probably could have been condensed into three or three and a half. The Blu-ray set is two discs with six episodes and a Digital HD code. The lone extra - Heart of a Homicide: Big Murder in a Small town – is interesting enough. The video presentation is 1080p with a 1.78:1 aspect ratio but as mentioned the picture comes across less crisp in true Soderbergh fashion. The DTS-HD master audio 5.1 is clean and clear and there is a nice balance between the dialogue and the soundtrack. The added element of the smartphone app gives Mosaic something unique, a different experiment of sorts. While it doesn't completely succeed in its intended goal it does make for a more interesting viewing experience overall. The cast and direction are worthwhile though. 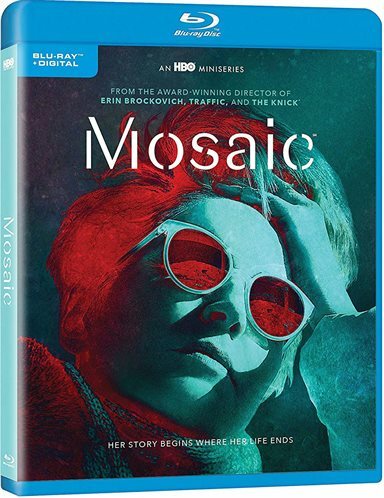 Download Mosaic from the iTunes Store in Digial HD. For more information about Mosaic visit the FlickDirect Movie Database.